Find Love, Lose Weight & Live Forever… Without Really Trying! Children across the UK are already fans of Dr Chris and Dr Xand from their hugely successful TV and live show Operation Ouch! Now the identical twins have an adults only show to share! Pleasure and danger are intimately linked: whether your weakness is cake, drugs, TV box sets or base-jumping, modern life presents humans with a set of temptations and consequential harms we can all understand. 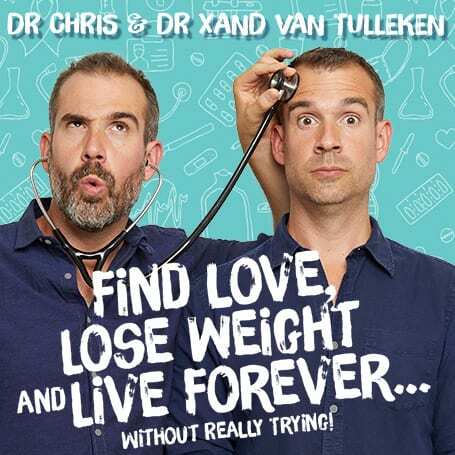 Dr Chris and Xand van Tulleken will examine how itís possible to get the most out of ourselves without self-help taking over our lives and without getting distracted by fads and nonsense. Working doctors and scientists trained at Oxford, and with a decade of making TV shows about health behind them, they will distillate live on stage the best of what they have learned from their experiences in the swamp forests of the Congo, Malaysian religious rituals, hallucinogens from the Amazon, naked swimming in the Arctic Ocean, work in refugee camps and war zones and everything in between.